Winter Tires By Drop-in or Appointment. These days, most of us like to do everything from our phones—book flights, order coffee, arrange playdates, even make appointments for tire installation. Thanks to Kal Tire’s new online shopping website, you can now book appointments to have your winter tires installed at the time and store that suits you! That said, as one of Canada’s most trusted tire shops, we also love doing things the old school way, so we want to remind drivers we’re happy to continue doing drop-ins! 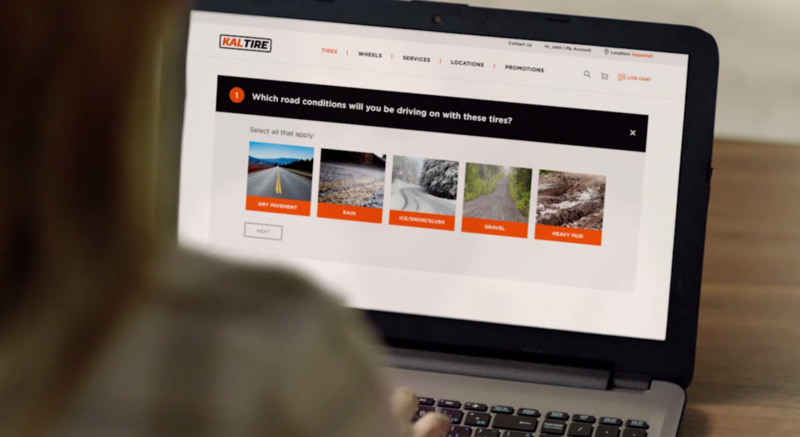 Let our super helpful online tire buying process guide you toward the right tires by asking you the same kinds of questions our team members ask in store—from the conditions you face to your priorities for performance and safety. We’ll also serve up Kal’s Tire Testing results so you can see how the tires you’re considering actually perform in third-party testing in real Canadian conditions. Select the tires you want, check out, and choose from available appointments at the Kal Tire location that’s convenient for you. We’ll send you a text or email reminder ahead of time, and look forward to seeing you on the day! When your vehicle’s ready, we’ll send a text to let you know. Find one of our Kal Tire locations near you. Drive into the parking lot. A team member will begin your work order and get your vehicle in the queue. You’re welcome to wait in the lounge, eat popcorn and read the latest edition of Kal Tire Times, or run a few errands and we’ll text you when your vehicle is ready. It’s really that easy! So, which way will it be for you: Visit Kal by dropping in a store, or shopping online and arranging your tire installation or winter tires changeover by appointment? Either way, we look forward to seeing you soon. Once the temperature is 7 C at best, summer and all-season tires become stiff and lose their grip, so it’s worth getting your winter tires on early.